Based on the 2008 graphic novel by Peter Simeti and Kevin Christensen, THE CHAIR was turned into a feature film in 2015 and enjoyed a limited theatrical release in 2016 and has been touring conventions and film festivals since. Now the film is coming to blu-ray & DVD this October and a Kickstarter has been launched to not only provide backers with some exclusives, but to also raise funds to format the film for digital releases through iTunes and Google Play with eventual stretch goals in mind for Hulu, Netflix, Amazon Prime, and more. 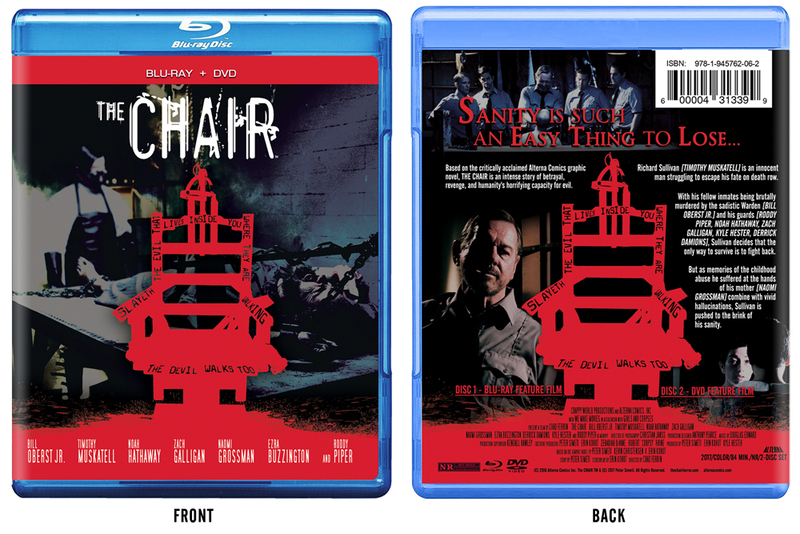 THE CHAIR is an intense horror/thriller that takes place on death row and boasts a surprisingly deep cast that includes the late Roddy Piper (WWE/WWF, They Live) in his last feature film role, Zach Galligan (Gremlins), Naomi Grossman (American Horror Story), Noah Hathaway (The Neverending Story), Bill Oberst Jr. (Criminal Minds), Tim Muskatell (Dead Girl), and Ezra Buzzington (The Hills Have Eyes). The Kickstarter offers various rewards, including original artwork; signed memorabilia; Alterna Comics graphic novels and single issues; and the most unique exclusive of them all: a fabric swatch of wardrobe worn by an actor during filming. The swatch is included with each copy of the blu-ray & DVD combo and comes with a Certificate of Authenticity that is also signed and verified by Simeti. The Kickstarter is the only place where this item will be available.